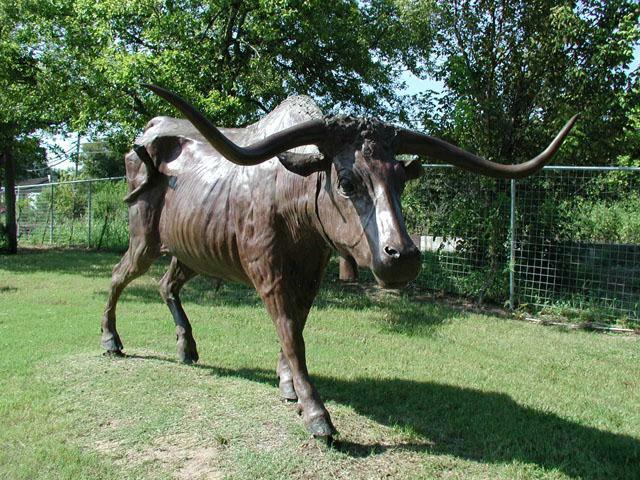 The round rock in Round Rock. There are lots of cities in the world. Each one of them needs a name and sometimes it's convenient to have a unique one. When a famous person's name won't do sometimes a community looks around for something that distinguishes this plot of land from the plot a few miles distant. 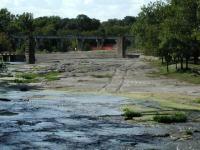 In the case of Round Rock, the citizens chose the natural landmark at a creek crossing that marked the center of town. 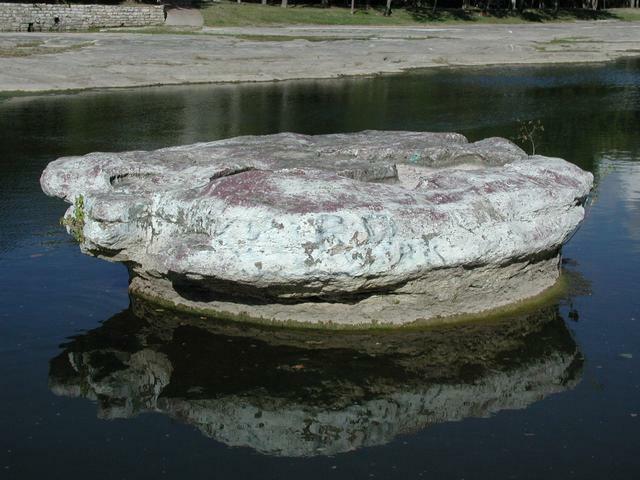 Round Rock was named after a real round rock, and it's still there. A view of the creek crossing from the east. 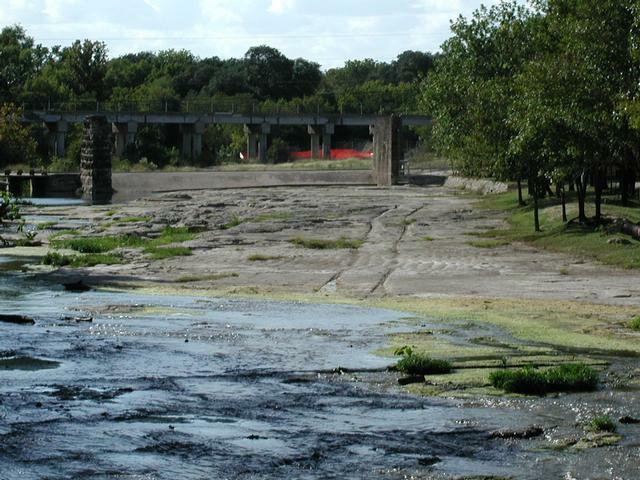 The Round Rock is just to the left of the picture, the wagon ruts angle to the right. 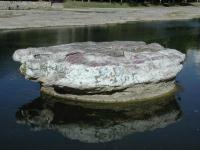 The rock is actually a rounded bulb of rock that rises above the rocky stream bed of Brushy Creek. The rock itself might have escaped any particular notice over the years but for one fact, it happened to reside at one of the easiest creek crossing points around and so served as a navigation device for settlers making the traverse. A close up of the wagon wheel ruts in the creek bed next to the Round Rock. So important was this crossing that the fabled Chisholm Trail, which was used to drive Texas cattle north to be loaded onto railroad cars to be brought to eastern markets, passed right by this rock. The large number of cattle, people and wagons crossing has left a permanent mark on the creek bed. 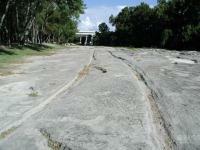 On the northern shore wagon wheel ruts have been carved into the rocky creek bed. 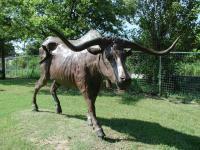 This statue of a Longhorn is one of a couple near the south shore of the river. Many like it were driven to railroad terminals in the north over this crossing. Long after the Chisholm Trail faded into memory the spot provided the easiest path for roads and bridges to span the creek. So within feet of the town's namesake a succession of bridges were built. With so much development nearby it takes a little more effort to imagine what the cattle crossings must have been like, but if you stare at the wagon ruts long enough you might yet hear the echoes of the cowboys and families that passed through here, at the crossing by the Round Rock.